Note to readers: The recently deceased Walter Cronkite clearly was a giant at CBS News. But behind the scenes, producer/director Don Hewitt was a mega-giant. Hewitt, who died on Wednesday, Aug. 19 at age 86 of pancreatic cancer, created 60 Minutes, presided over the first televised presidential debate in 1960 and also directed the first network television newscast on the night of May 3, 1948. 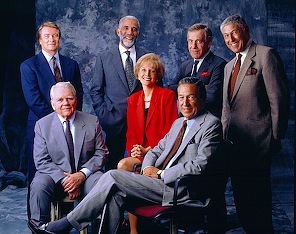 He remained with 60 Minutes from its launch on Sept. 24, 1968 until stepping down as executive producer in 2004. Outspoken and demanding, Hewitt lived by the credo, "Tell me a story." In November of 2002, he received the Algur H. Meadows Award for Excellence in the Arts from Dallas-based Southern Methodist University. "A lot of nice things have happened to me in my life," he said upon accepting the honor. "But this takes the cake." I interviewed him for the last time on that occasion and also shared a panel with Hewitt during a series of events tied to the Meadows award. The following article was first published on Nov. 9, 2002. DALLAS -- It took Don Hewitt just a minute or two -- not 60 minutes -- to realize that his life's calling would be the words and pictures residing within a new contraption called television. "Whata-vision?" had been his initial incredulous reaction in the late winter of 1948. Fortunately for CBS News, he quickly saw the endless possibilities. "People say to me, 'what time do you go to work in the morning' Do you know what I say? 'I don't go to work. I haven't gone to work since the day I got there.' I've had a love affair with that place, from (Walter) Cronkite and (Edward R.) Murrow down to Mike Wallace and the rest of the guys. So I don't go to work. I've never considered it work." In some ways, it's harder work being appreciated. Hewitt, who turns 80 next month, has been Southern Methodist University's resident deity since Wednesday of this week. He's granted interviews, attended six journalism classes and several luncheons, been the focal point of two evening panel discussions and finally will cap it all off Saturday night by accepting the Algur H. Meadows Award for Excellence in the Arts at a black-tie dinner ceremony. The creator of 60 Minutes and the producer-director of TV's first presidential debate is also the first journalist to be honored by Meadows. His august company includes actress Angela Lansbury, composer Stephen Sondheim, musician Wynton Marsalis, choreographer Martha Graham, playwright Arthur Miller, film director Ingmar Bergman and opera singer Leontyne Price. Not generally known for exhibiting a cuddly grandpa's demeanor, the outspoken Hewitt has been basking agreeably. "Did you ever meet a ham who didn't like it?" he asks. "Yeah, I love it. It's very nice." It's his first visit to Texas since 1971, when Hewitt and senior 60 Minutes correspondent Mike Wallace visited former President Lyndon Johnson and his wife, Lady Bird, at their ranch outside Austin. He vividly recalls a crack-of-dawn convertible ride with LBJ, who gobbled a candy bar and then instructed Hewitt to deposit the wrapper in a nearby trashcan. "Then he drove off and left me. I was running down the road after him. I guess he was trying to show me who was boss on his ranch." Back home in present-day New York, another indignity might be looming. Hewitt's 35-year reign over 60 Minutes reportedly is imperiled, even though CBS News president Andrew Heyward responded by telling the Associated Press, "I certainly hope that Don is part of CBS for as long as he wants to be." Although it's still prime-time's most-watched news program, 60 Minutes has dropped out of the top 20 in total viewers. Even worse, it attracts the oldest audience of any CBS program. A 30-second commercial on 60 Minutes sells for a relatively puny $90,000, according to estimates by the trade magazine Advertising Age. The WB's Smallville has a $111,500 price tag despite averaging 6 million fewer viewers this season than 60 Minutes. That's because most of Smallville's audience is comprised of advertiser-craved younger viewers. Hewitt, still a relative kid compared to Wallace, 84, and 60 Minutes commentator Andy Rooney, 83, vows to leave CBS on his own terms, and probably not anytime soon. 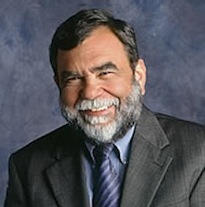 He estimates that 60 Minutes has netted the network $2 billion in profits during its long run. "Listen, at 80 years old, maybe somebody should be thinking about what they're going to do next," he says. "But I don't think anything's imminent. I'm signed for three more years, I've got no problems. I've gotta tell you the day will come that I don't want to work there faster than the day will come that they don't want me to work there. "But they're not about to do anything," he adds. "60 Minutes makes CBS respectable enough to do a lot of the other stuff that makes them money, such as Survivor. It's still considered the gold standard and I think they're aware of that." Hewitt lately has watched ABC's 20/20 take dead aim at a younger audience by heavily hyping Barbara Walters' series of November "sweeps" interviews with Justin Timberlake, the Osbournes and Brandy. Next week, Diane Sawyer will gab with Jennifer Lopez on the network's Prime Time Thursday news program. "The suggestion is that 60 Minutes do profiles on some of these younger personalities," Hewitt says. "But we'd have to change who we are and what we are. I'd do Britney Spears if she had something interesting to say to me. But I'm not interested in doing bubbleheads to reach a bubblehead audience." "I would venture a guess that we'll end up with bigger ratings doing what we always do than she (Walters) will with Justin Timberlake and the Osbournes and God knows what else. Barbara is a force of nature. She just keeps going and going. I once said to her, 'Do you realize that we'll still be on the air when Jane Pauley's dead?' They're desperate at ABC. They're so desperate that they're going to take a big-name newsperson and use her to increase their audience with younger people. That's a desperation move. Not on her part. On the part of her bosses." Whatever his fate at CBS, Hewitt can look back on a singular career in which he's both worked with television's greatest journalists and been an eyewitness to many of modern history's towering events. The coronation of Queen Elizabeth II. Winston Churchill's funeral. Omaha Beach on D-Day. John Glenn's first space flight. "I don't know, it just seems natural," he says. "It doesn't seem like 'Oh, gee whiz' to me. I've had a great life, but life is finite. You know it's going to end. All you want to do is end it in a good place. If it ended right now, talking to you, that ain't a bad place. "It's better than being in an old man's home." Dec. 22, 1922 -- Born in New Rochelle, NY, the son of Frieda and Ely Hewitt. Dec. 7, 1942 -- Arrives as a cadet at the Merchant Marine Academy at Kings Point, NY. July 1943 -- Becomes night telephoto editor for ACME News Pictures. March 22, 1948 -- Joins CBS News, where his first assignment is associate director of the nightly 15-minute Douglas Edwards With the News. June 2, 1953 -- Produces and directs CBS News' coverage of the coronation of Queen Elizabeth II. Sept. 26, 1960 -- Produces and directs first nationally televised presidential debate between John F. Kennedy and Richard Nixon. Sept. 24, 1968 -- Creates 60 Minutes, which originates with Mike Wallace and Harry Reasoner as anchors. 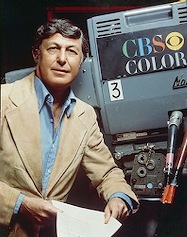 1990 -- Is inducted into the Television Academy Hall of Fame. Nov. 9, 2002 -- Will become the first newsman to receive the Algur H. Meadows Award for Excellence in the Arts. Rewinding to KXAS-TV's explosive hidden camera investigation of a Dallas Cowboys "Triplet"
Note to readers: As the Dallas Cowboys begin another season, we revisit KXAS-TV's controversial "Tarnished Star" hidden camera investigation of All-Pro receiver Michael Irvin. Investigative reporter Marty Griffin and the Fort Worth-based NBC station became subjects of a national debate over the ethics of their alleged "checkbook journalism." Those were the days when station managers and news directors were unafraid to speak their minds. KXAS also had a since disbanded investigative unit at the time. Griffin is now with KDKA-TV, Pittsburgh's CBS station. 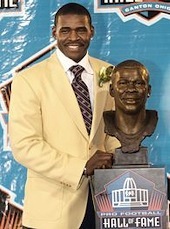 Irvin's in the Hall of Fame after pleading no contest to charges of cocaine possession. KXAS general manager Doug Adams now is president of the Dallas Symphony Orchestra. 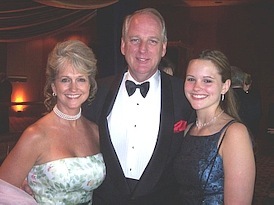 WFAA executive news director John Miller currently teaches journalism at Texas Christian University. This article originally was published on May 14, 1996. Michael Irvin's trial still awaits him, but the court of public opinion seems to be weighing heavily against the tactics employed by KXAS-TV (Channel 5) in its "Tarnished Star" investigation of the Dallas Cowboys star. The station's use of a hidden camera and its $6,000 payment to an informant during a highly competitive rating "sweeps" period are clearly unpopular among talk radio show callers and commentators, general manager Doug Adams agreed Friday. Channel 5 also has received a heavy volume of negative phone calls, he confirmed. "There's a lot I'd like to say," he said. But at the advice of the station's attorneys, "our position from the beginning has been to let the stories play out. I would anticipate at some time we might talk about it." Ethical questions about hidden cameras and paying for news aren't new to television journalism. But they have proved to e a particularly volatile combination in a case where the subject of the stories is a high-profile member of America's most talked-about football team. "Are there any limits to the use of hidden cameras? Is Michael Irvin a sufficiently newsworthy figure to justify what otherwise might be construed as an invasion of privacy? These are very important questions to keep asking," said David Bartlett, president of the Washington, D.C.-based Radio-Television News Directors Association. "But I don't see anything to suggest that there is anything wrong with this story, unless I'm Michael Irvin's defense attorney." Channel 5's dark, fuzzy video and at times murky audio purportedly link Irvin to cocaine buys made both before and after his April 1 indictment on drug charges in an unrelated case. Dennis Pedini, who drove Irvin after equipping his car with a hidden camera, was paid by the station for "licensing and assigning rights to KXAS for this videotape," viewers have been told. Professor Tom Bigler, a former television news anchor and reporter who teaches a journalism ethics course at Wilkes University in Pennsylvania, said Channel 5 is clearly out of bounds. "Checkbook journalism always is questionable. Personally, I despise it," Bigler said. "But to use it for entrapment is doubly wrong. Are they part of the police department? It's a rather unethical and sleazy approach to collecting news." Despite the heavy criticism, Channel 5 has been dominating the 10 p.m. Nielsen ratings since "Public Defender" Marty Griffin's series began airing on Sunday. Slightly past the halfway point of the May sweeps, which end on May 22, Channel 5 is in a strong position to dethrone perennial champion WFAA-TV (Channel 8). Through Thursday, Channel 5 had an 18.1 rating while Channel 8 was averaging a 16.7 rating. KDFW-TV (Channel 4) and KTVT-TV (Channel 11) each are running 10 or more points behind the two top stations. each point equals 18,200 households in the Dallas-Fort Worth viewing area. Sweeps competitions, also held in November and February, are used to adjust the rates stations charge to advertisers. Channel 5 hasn't been No. 1 at 10 p.m. since November 1987, when the station tied Channel 8. "They (Channel 5) very well might win, but so be it," Channel 8 executive news director John Miller said. "We'd rather be No. 2 than be doing what they're doing. It's almost to the point where they're programming the destruction of their credibility and people are watching it. Long-term, you're really hurting yourself." Short-term, Channel 8 and other rival stations have been airing stories aimed at denting the credibility of Channel 5's paid informant. Channel 8 reporter Brett Shipp even went to the extent of telling viewers that Pedini owed more than $600 in traffic tickets. The station began one report with Irvin's attorney, Kevin Clancey, asking in a courthouse corridor, "Is the $6,000 man here yet?" Channel 5's Adams said it is "interesting that some media outlets are ignoring a story on which they've been scooped in favor of a story that they choose to pursue instead. It's amazing how sanctimonious people get when they've been scooped." Doug Adams and John Miller, former execs at KXAS and WFAA. In its first segment of "Tarnished Star," Channel 5 hid Pedini's face and referred to him only as "Dennis." The station didn't disclose its $6,000 payment to Pedini until Tuesday's 10 p.m. newscast. On Wednesday, Channel 5's informant was subpoenaed and bound by a gag order that prohibits him from talking any further about Irvin. Former Channel 5 "public defender" Mike Androvett, who recently became the co-partner of a media consulting firm, said that Pedini's apparently checkered past is typical of sources and informants. Earlier in the week, Pedini came to Androvett's offices for advice. "Any investigative reporter just begs for the day that when he gets a good story, his source is absolutely pristine," Androvett said. "But they never, never are. They want to get noticed or maybe they want to get a little money out of it. By definition, these quandaries land at your door." The Radio-Televison News Directors Association, which monitors newscasts and occasionally takes positions on ethical issues, is generally against paying for news, Bartlett said. But immediate disclosure of any such payments is "the more important aspect of the issue," he said. "Then the audience can make an informed judgment about the credibility of the story. Some people may think it kills it. Others may think it makes no difference at all." Channel 8's Miller said that network and local news operations sometimes make legitimate payments for news footage obtained from outside sources. For instance, amateur video that appeared to show accused Oklahoma City bomber Timothy McVeigh in Waco recently was bought by Channel 11 for $500. "That doesn't violate any ethical rules," Miller said. "It's similar to a newspaper buying a photo from somebody." But paying for secretly obtained footage of Irvin in a private car amounts to "entrapment" of a man who already has been indicted, Miller said. "We wouldn't have set up that situation because our lawyers would have said, 'You're got to be crazy.' We don't play that game." Channel 8 was criticized last year, however, for using a hidden camera in an attempt to expose alleged lax security at Sunset High School. A part-time intern for the station posed as a student and secretly took pictures until being discovered by school officials. 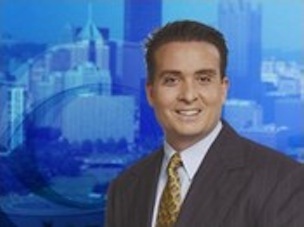 The station subsequently apologized to Sunset principal Michael Stiles, who had complained about "extremely unethical" reporting procedures. Charles Duncan, a former Channel 8 investigative reporter who left the station in 1989 to start a private detective agency, said he frequently has used hidden cameras in both professions. "The camera was not put in Michael Irvin's car. He was getting into someone else's car who knew the camera was there," Duncan said. "I don't see a real problem there." Duncan said he disagreed, however, with Channel 5's decision to both pay Pedini and "rely on him altogether." "The Channel 5 reporter was not with Dennis at the time. He doesn't know what happened before, he doesn't know what happened after," Duncan said. Former Channel 4 news director Mike Sechrist, currently general manager of a TV station in Nashville, said it is "always risky to give the camera to somebody else." "You just don't know if you've been set up," he said. "When your people do it, you trust them." Channel 5 would have been on firmer ground had it followed Pedini's car or staked out a location where Irvin allegedly purchased drugs, Sechrist said. "The way they got the story is taking away from the story itself." Bartlett of the news directors' group said it does not have a position on use of hidden cameras, which increasingly have become commonplace on both local and network news programs. "Our code of ethics addresses deception of the public," he said. "It's okay to deceive the bad guys, but you don't deceive the audience. And it's vitally important that you do not cross the line into invasion of privacy." Was the line crossed in Irvin's case? Probably not, Bartlett said, because the Cowboys' star is a public figure whose alleged drug purchase "is a newsworthy story by any measure." "After all, they're not taking hidden camera pictures to show that he's abusing his rose bushes," Bartlett said.